Exhibit B: Medieval manuscript found in a box in a college library. 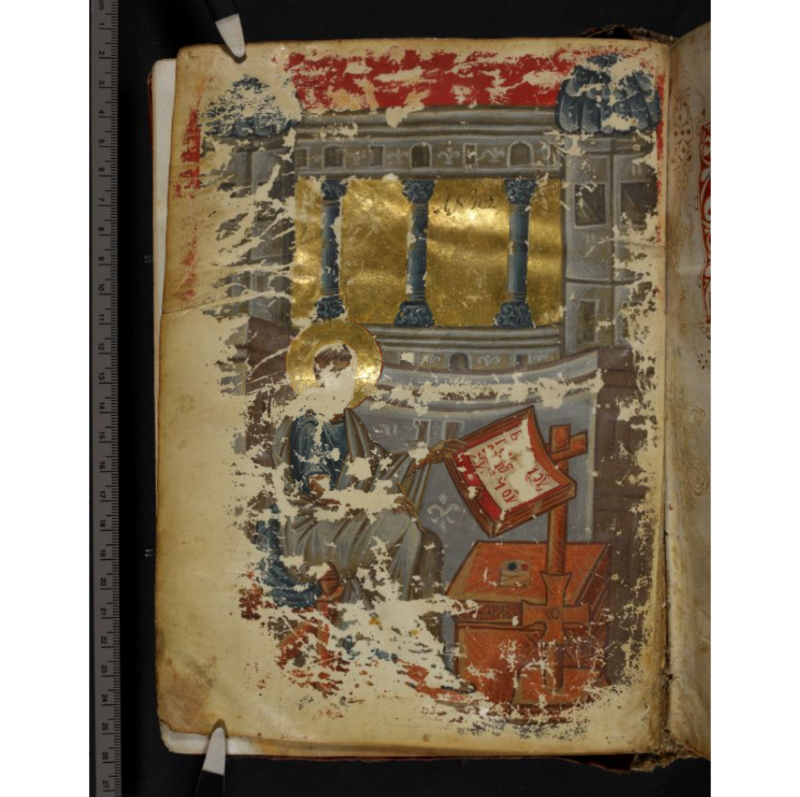 Just a reminder: "the best place to look for ancient manuscripts is in a library" (cf. previously here and here). This is a helpful introduction to the process of interpreting texts on papyrus. 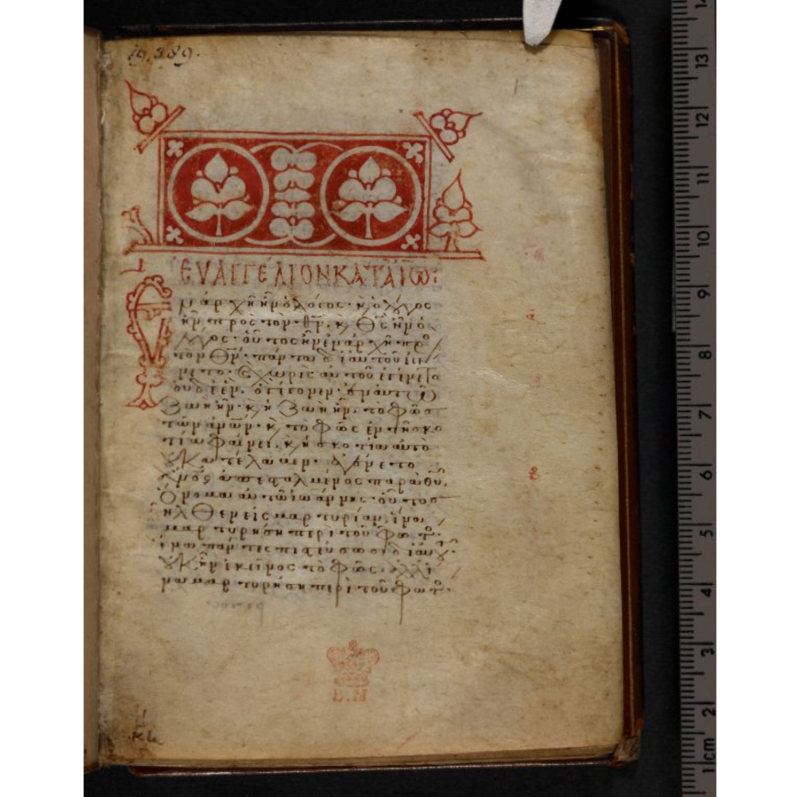 This is a very helpful discussion of certain limitations in the current formatting of the Duke Database of Documentary Papyri and the way those limitations impact on searching. This is an interesting discussion, based initially on the new Sappho papyrus which Dirk Obbink announced a couple of weeks ago. Following on from the previous post (and no, not something from the Simpsons), this includes an interesting up-date about the Green Collection. NA27: Novum Testamentum Graece (ed. B. & K. Aland et al. [E. Nestle]; Stuttgart: Deutsche Bibelgesellschaft, 199327, cf. 18981, 197926). NA28: Novum Testamentum Graece (ed. B. & K. Aland et al. [E. Nestle]; INTTF, H. Strutwolf; Stuttgart: Deutsche Bibelgesellschaft, 201228, cf. 18981, 197926, 199327). 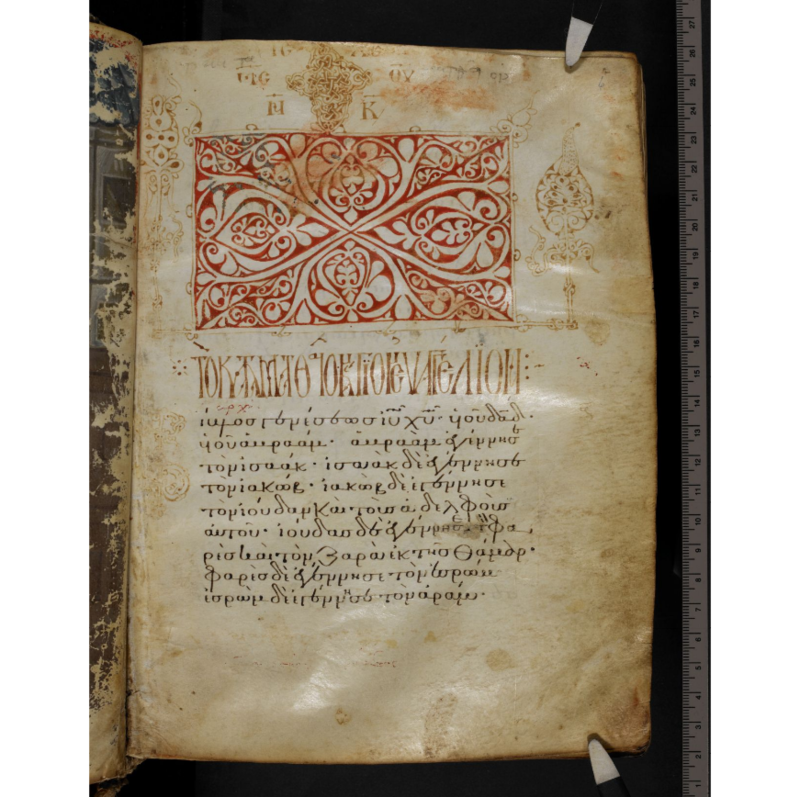 UBS4: United Bible Societies, The Greek New Testament. Fourth Revised Edition (ed. B. & K. Aland et al. ; Stuttgart: Deutsche Bibelgesselschaft & UBS, 19934). B.M. 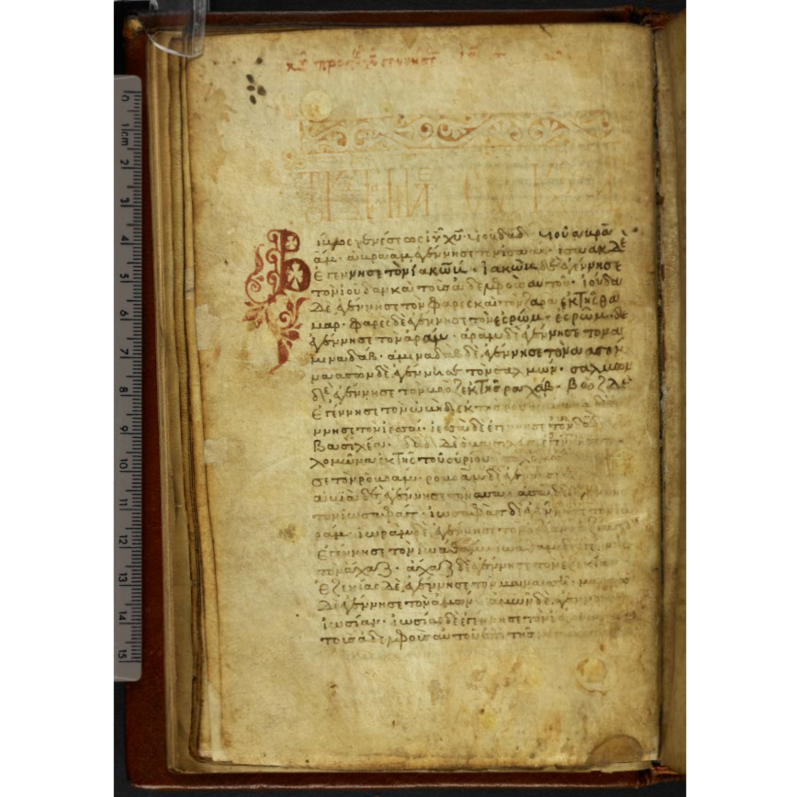 Metzger, A Textual Commentary on the Greek New Testament. Second Edition. A Companion Volume to the United Bible Societies’ Greek New Testament (Fourth Revised Edition) (Stuttgart: Deutsche Bibelgesellschaft & UBS, 1994). Comments on variants in UBS GNT (from editorial perspective): pp. 656-661: v1, 3, 4, 5 (extensive with minority report), 8, 12, 19, 22-23 (more extensive), v22, 23, 25. *Jude 5/20 (p. 410): Ihsouj / (o) kurioj (NA27). Jude 14/28-32 (p. 422): agiaij muriasin autou (NA27) / muriasin agiaij autou. T. Wasserman, The Epistle of Jude: Its Text and Transmission (CBNT 43; Lund: Almqvist & Wiksell, 2006). Independent text established on basis of a complete transcription of 560 manuscripts of Jude. Studies of papyrus witnesses (P72, ch 2; P78, ch 3); extensive textual commentary. (6 page list of corrections to ECM1). Wasserman’s reconstructed text differs in five places from the ECM1 text: ku/rioj is preferred in v5; a0pafri/zonta in v13; pa/ntaj tou\j a0sebei=j in v15; and both o#ti and tou= are read in v18. C. Landon, A Text-Critical Study of the Epistle of Jude (JSNTSS 135; Sheffield: Sheffield Academic Press, 1996). R.J. Bauckham, Jude, 2 Peter (WBC 50; Waco, TX: Word, 1983). Probably the best all-round commentary. C.A. Bigg, A Critical and Exegetical Commentary on the Epistles of St. Peter and St. Jude (ICC; Edinburgh: T & T Clark, 1901; New York: Scribner’s Sons, 1922). P.H. Davids, 2 Peter and Jude: A Handbook on the Greek Text (Waco, TX: Baylor UP, 2011). G.L. Green, Jude & 2 Peter (BECNT; Grand Rapids: Baker, 2008). Uses transliteration, but lots of comment and notes on the Greek. Neyrey also wrote the brief commentary on Jude in NJBC, pp. 917-19. J.S. Allen, ‘A New Possibility for the Three-Clause Format of Jude 22–3’ NTS 44 (1998), 133–143. P. F. Bartholomä, ‘Did Jesus Save the People out of Egypt? A Re-examination of a Textual Problem in Jude 5’ NovT 50 (2008), 143–158. R.J. Bauckham, Jude and the Relatives of Jesus in the Early Church (Edinburgh: T & T Clark, 1990). This includes (as chapter 3) a revised version of his ‘The Letter of Jude: An Account of Research’ from Aufstieg und Niedergang der römischen Welt II.25.5 (1988), 3791-3826. J. N. Birdsall, ‘The Text of Jude in P72’ in Collected Papers in Greek and Georgian Textual Criticism (TaS 3rd Series 3; Piscataway, N.J.: Gorgias 2006), 73–77. G. J. Brooke, ‘Torah, Rewritten Torah and the Letter of Jude’ in The Torah in the New Testament. Papers Delivered at the Manchester-Lausanne Seminar of June 2008 (eds M. Tait & P. Oakes; LNTS 401; London/New York: Continuum, 2009), 180–193. W. Brosend, ‘The Letter of Jude. A Rhetoric of Excess or an Excess of Rhetoric?’ Interp. 60 (2006), 292–305. T. Caulley, ‘Balaak in the P72 Text of Jude 11. A Proposal’ NTS 55 (2009), 73–82. J.D. Charles, ‘‘Those’ and ‘These’. The Use of the Old Testament in the Epistle of Jude’ JSNT 38 (1990), 109–124. J.D. Charles, ‘Literary Artifice in the Epistle of Jude’ ZNW 82 (1991)106-124. J.D. Charles, ‘The Angels under Reserve in 2 Peter and Jude’ BBR 15 (2005), 39-48. B. Dehandschutter, ‘Pseudo-Cyprian, Jude and Enoch. Some Notes on 1 Enoch 1:9’ in: Tradition and Re-Interpretation in Jewish and Early Christian Literature (FS Jürgen C. H. Lebram; ed. J.W. van Henten; Leiden: Brill, 1986), 114–120. M. Desjardins, ‘Portrayal of the Dissidents in 2 Peter and Jude: Does it Tell Us More About the “Godly” Than the “Ungodly”?’ JSNT 30 (1987), 89-102. L.R. Donelson, ‘Jude as Text with Excess of Context’ in Antiquity and Humanity: Essays on Ancient Religion and Philosophy Presented to Hans Dieter Betz on his 70th Birthday (eds M.M. Mitchell & A.Y. Collins; Tübingen: Mohr Siebeck, 2001), 279–295. E. E. Ellis, ‘Prophecy and Hermeneutic in Jude’ in Prophecy and Hermeneutic in Early Christianity: New Testament Essays (WUNT 18; Tübingen: J.C.B. Mohr & Grand Rapids: Eerdmans, 1978), 220-36. I.H. Eybers, ‘Aspects of the Background of the Letter of Jude’ Neotestaentica 9 (1975), 113-123. T. Flink, ‘Reconsidering the Text of Jude 5, 13, 15 and 18’ Fil. Neot. 20 (2007), 95-125. J. Frey, ‘The Epistle of Jude between Judaism and Hellenism’ in The Catholic Epistles and Apostolic Tradition (eds. K.W. Niebuhr & R.W. Wall; Waco, TX: Baylor UP, 2009), 309-329. J.J. Gunther, ‘The Alexandrian Epistle of Jude’ NTS 30 (1984), 549-62. H. Harm, ‘Logic Line in Jude. The Search for Syllogisms in a Hortatory Text’ Occasional Papers in Translation and Textlinguistics 1 (1987), 147–172. J. F. Hultin, ‘Jude’s Citation of 1 Enoch’ in Jewish and Christian Scriptures. The Function of “Canonical” and “Non-Canonical” Religious Texts (eds J.H. Charlesworth & L.M. McDonald; JCTCRS 7; London/New York: Continuum, 2010), 113–128. P.R. Jones, The Epistle of Jude as Expounded by the Fathers - Clement of Alexandria, Didymus of Alexandria, the Scholia of Cramer’s Catena, Pseudo-Oecumenius and Bede (TSR 89; Lampeter: Edwin Mellen Press, 2001). S.J. Joseph, ‘”Seventh from Adam” (Jude 1:14-15): Re-examining Enochic Traditions and the Christology of Jude’ JTS 64 (2013), 463-481. S.J. Joubert, ‘Language, Ideology, and the Social Context of the Letter of Jude’ Neotestamentica 24 (1990), 335-49. S.J. Joubert, ‘Persuasion in the Letter of Jude’ JSNT 58 (1995), 75–87. S.J. Joubert ‘Facing the Past. Transtextual Relationships and Historical Understanding in the Letter of Jude’ BZ 42 (1998), 56–70. S.J. Joubert, ‘When the Dead are Alive! The Influence of the Living Dead in the Letter of Jude’ HTS 58 (2002), 576–592. M.A. Kruger, ‘Toutois in Jude 7’ Neotest. 27 (1993), 119–132. S. Kubo, ‘Jude 22-23: Two Division Form or Three?’ New Testament Textual Criticism, Its Significance for Exegesis: Essays in Honour of Bruce M. Metzger (eds: E.J. Epp & G.D. Fee; Oxford: Clarendon, 1981), 239-253. K. R. Lyle. Ethical Admonition in the Epistle of Jude (Studies in Biblical Literature 4; New York: Peter Lang, 1998). E. Mazich, ‘“The Lord Will Come with His Holy Myriads”. An Investigation of the Linguistic Source of the Citation of 1 Enoch 1,9 in Jude 14b-15’ ZNW 94 (2003), 276–281. N.J. Moore, ‘Is Enoch Also Among the Prophets? The Impact of Jude’s Citation of 1 Enoch on the Reception of Both Texts in the Early Church’ JTS 64 (2013), 498-515. J. Muddiman, ‘The Assumption of Moses and the Epistle of Jude’ Moses in Biblical and Extra-Biblical Traditions (eds A. Graupner & M. Wolter; BZAW 372; Berlin/New York: de Gruyter, 2007), 169–180. T. Nicklas, ‘Der “lebendige Text” des Neuen Testaments. Der Judasbrief in P72 (P. Bodmer VII)’ ASE 22(2005), 203–222. C.D. Osburn, ‘The Christological Use of 1 Enoch I.9 in Jude 14,15’ NTS 23 (1976-77), 334-341. C.D. Osburn, ‘The Text of Jude 5’ Biblica 62 (1981), 107-115. C.D. Osburn, ‘Discourse Analysis and Jewish Apocalyptic in the Epistle of Jude’ in Linguistics and New Testament Interpretation. Essays on Discourse Analysis (ed. D.A. Black; Nashville: Broadman 1992), 287–309. G. van Oyen, ‘Is There a Heresy That Necessitated Jude’s Letter?’ in Empsychoi Logoi. Religious Innovations in Antiquity (FS P.W. van der Horst; eds. A. Houtman, A. de Jong & M. Misset-van de Weg; AJECAGJU 73; Leiden/Boston: Brill, 2008), 211–226. J. T. Reed & R.A. Reese, ‘Verbal Aspect, Discourse Prominence, and the Letter of Jude’ Filología neotestamentaria 9 (1996), 181–199. R.A. Reese, Writing Jude: The Reader, the Text and the Author in Constructs of Power and Desire (Biblical Interpretation Series; Leiden: Brill, 2000). J.M. Ross, ‘Church Discipline in Jude 22–23’ ExpT 100 (1989), 297–298. D.E. Rowston, ‘The Most Neglected Book in the New Testament’ NTS 21 (1974f), 554-563. D.F. Watson, Invention, Arrangement, and Style: Rhetorical Criticism of Jude and 2 Peter (SBLDS; Atlanta, GA: Scholars, 1988), 29-79. R. L. Webb & P. H. Davids (eds. ), Reading Jude with New Eyes: Methodological Reassessments of the Letter of Jude (LNTS; London: T & T Clark, 2008). R.L. Webb, ‘The Eschatology of the Epistle of Jude and Its Rhetorical and Social Functions’ Bulletin for Biblical Research 6 (1996), 139-151. R.L. Webb, ‘The Use of ‘Story’ in the Letter of Jude: Rhetorical Strategies of Jude’s Narrative Episodes’ JSNT 31 (2008), 53–87. E.R. Wendland, ‘A Comparative Study of “Rhetorical Criticism”, Ancient and Modern, with special reference to the Larger Structure and Function of the Epistle of Jude’ Neotestamentica 28 (1994), 193-228. S. C. Winter, ‘Jude 22-23: A Note on the Text and Translation’ HTR 87 (1994), 215-222. F. Wisse, ‘The Epistle of Jude in the History of Heresiology’ Essays on the Nag Hammadi Texts (FS A. Böhlig; NHS 3; ed. M. Krause; Leiden: Brill, 1972), 133-143. T.R. Wolthuis, ‘Jude and Jewish Traditions’ Calvin Theological Journal 22 (1987), 21-41. T.R. Wolthius, ‘Jude and the Rhetorician. A Dialogue on the Rhetorical Nature of the Epistle of Jude’ CTJ 24 (1989), 126–134. There are some things I really like about Wikipedia (although I don't really buy into David Parker's view that the Bible grew like a wikipedia article). It always comes up first in a google search so it is easy to find. It sometimes has really good pictures. And it usually has a jumble of information without any real coherent flow (which I generally don't mind). And lots of sentences finish with a reference (although it is not usually to the most relevant source). But a lot of scholars apparently don't like it and won't let their students use it. So how bad is wikipedia? I find it is sometimes helpful to check as one port of call among others, when I am up-dating a lecture; just to see: a) whether some stupid new idea has come out that I should be aware of; b) whether there is something really obvious I should include in my notes for a lecture; and c) what information people can glean entirely from secondary sources without ever having necessarily studied the subject. 1. "Wettstein designated it in 1751 by letter A, and it was the first manuscript to receive thus a large letter as its designation." If we overlook the 'large letter', we find here a typical wikipedia problem: two true facts are brought together in a stupid edit to create a false statement. Yes Wettstein designated it as A, yes, it was the first to have such a designation. But no, the connection between these statements ("thus") is wrong. It was already designated as "A" in Walton's Polyglot in 1657. 2. "The fourth volume contains the New Testament with 31 leaves lost." This is another typical wikipedia problem - the partial evidence taken as the full picture. What is the case? Well yes 31 leaves have been lost from the New Testament; but there are also leaves missing from 1 Clement (1 leaf) and 2 Clement (probably 2 leaves), both of which are in the fourth volume (leaving aside the possibility that they might be in Codex Alexandrinus' New Testament). So at least 34 leaves are lost from the fourth volume. 3. Here we are told: "Previously, General epistles were placed before Acts of the Apostles. They changed their positions after rebinding." (on the supposed authority of Westcott). But that is not what the colophon in the photo says, rather that this brings to a close "the Acts of the Apostles and the Catholic [Epistles]". Acts can't come after the Catholic Epistles because on the same page we have the end of Acts in the first column and the start of James in the second column. In fact Westcott said no such thing as is here stated. He gave the table of contents of Alexandrinus, further confirmation against the view that the order was changed in binding. As we shall see wikipedia has a keen interest in changes brought about in the binding of this manuscript. 4. Completely disconnected things put next to each other as if they are somehow related. There is a whole section further down on Textual Features, put those "Verses the scribe did not include" down there. 5. Leaving aside the fact that this also should be down in "Textual Features", this illustrates another wikipedia problem - inability to nuance and over-confidence in what can be proven. "In the lost two leaves (John 6:50-8:52), by counting the lines, it has been proven that it was not in the book – there was not room for it". So obviously it can be shown that if the text continued as normal there would not be enough space on the two missing leaves for all the text if 7.53 - 8.11 was included. And it is reasonable to assume that this amount of text was missing, and further that these verses were the missing ones. But we can't prove it wasn't some other twelve verses, or that these verses weren't added in the margin, or weren't somewhere else in the book (maybe somewhere in Matthew!). So we should say that A probably lacked these verses (Avid as in NA). 6. This is a doozy: "... most of the folios were originally gathered into quires of eight leaves each. In modern times it was rebound into quires of six leaves each." Now this sounds plausible enough, so long as you have no idea at all what a quire is. Incidentally I was so taken by this idea I thought about showing what the result would be like (but this is taking too long already). I do know that this completely wrong (and incidentally undocumented) statement has spread from wikipedia to other places on the interweb (e.g. Orthodoxwiki and answeringchristianity and thiswikipediaripoff). 7. The ye-olde English pretty obvious plagiarism detector: "whensoever" is probably enough, but those two sentences are both very odd: "The vellum has been fallen into holes in many places" - this may have meant something in its original context, but it no longer does. 8. (It looks like I'll easily make 10). Here we have another wikipedia staple: completely irrelevant information included for no obvious reason. "Words are written continuously in a large, round and well-formed uncial hand, with no accents and only some breathings (possibly added by a later editor). The letters are larger than those of the Codex Vaticanus. There is no division of words, but some pauses are observed in places in which should be a dot between two words." (I pass over the final phrase in silence). Here is a perfectly helpful couple of sentences, along with the interjection: "The letters are larger than those of the Codex Vaticanus." Oh yeah, like we all know how large those letters are! And this matters how? And why only one comparison? 9. That same clip has a typical wikipedia doublet. In fact a double doublet: "no accents and only some breathings (possibly added by a later editor). ... There are no accent and breathing marks, except a few added by a later hand ..." cf. also "There is no division of words, but some pauses are observed in places in which should be a dot between two words ... but the punctuation was written by the first hand." Well this one is a contradictory doublet! 10. Leaving aside the fact that the proposed change of scribe at 1 Cor 10.8 was already mentioned a few paragraphs earlier, this sentence has a rather arbitrary element: "... who had better tools for comparison...". One could say that Milne and Skeat considered Kenyon's view and found it wanting (and perhaps that they have been followed by contemporary scholars - although I doubt that is particulary relevant unless they have also checked the data); but I don't see that they had any better tools than Kenyon did. They all worked with the manuscript itself. What other tools are there? That is ten problems in the first half of the entry. And there are many more in the second half. I can see why many people advise students to avoid wikipedia. Wikipedia is quite bad. Facts are wrong, correct facts are placed in the wrong context, incorrect conclusions are drawn. Some of these errors would seem to have been deliberately inserted (either that or very stupid people are getting things badly wrong and adding them in). The best and most recent scholarship is cited the least. Evidence is not routinely provided. And the overall style is dreadful. The interesting thing is that this VI-VIIth century papyrus is mounted within the borders of a piece cut from the Mreviary of Margaret of York (a XVth cent manuscript). 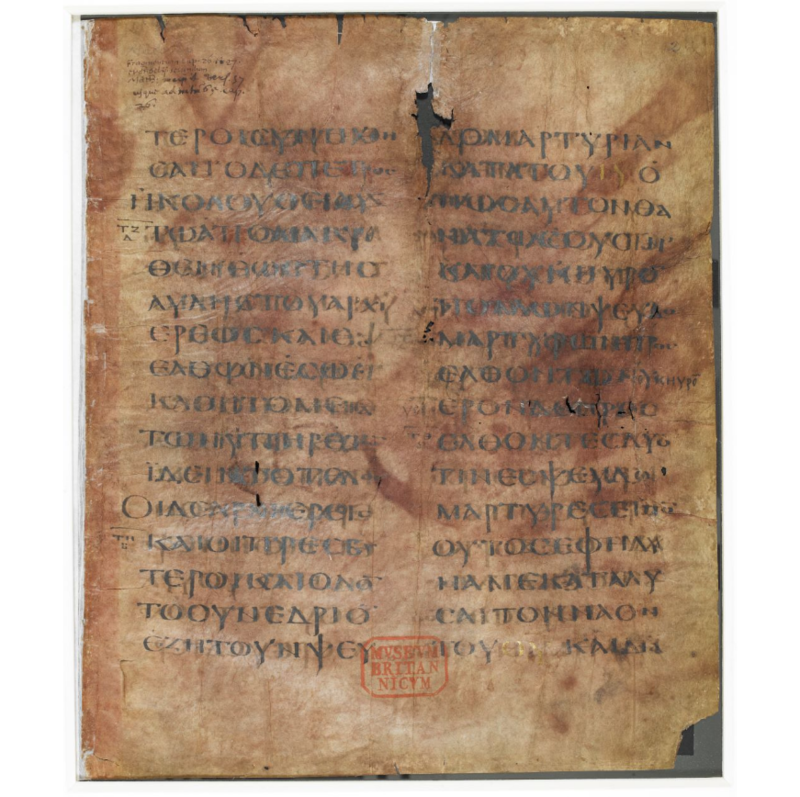 Following the lead of R. Babcock (who published the papyrus as an early copy of Gregory's Homilies on the Gospels in Scriptorium 54 (2000), 280-288) it is suggested that the original codex could have come over with early missionaries sent to England by Gregory himself: 'it could even be the case that it was an early copy of the Homilies (completed in 592-3) brought over by Augustine of Canterbury when he arrived in Kent in 597.' This gets a bit speculative for me, but I thought I would pass it on. My palaeography/TC class has been assigned a GSI MS this semester, and we are having a lot of fun working on it. It is an early minuscule, extant only in 9 leaves. We are working on trying to explain why the 9 leaves are separate. There is not a single double fold, though there are two sets of two leaves that are connected by use of a reinforcement. In addition, one of the single leaves has a strip of parchment (contiguous with it) surviving on the other side of the hinge. The leaves come from Mt, Mk, and Jn, and there is (later) numbering that implies around 400 sides (every recto and verso has a number), so it must have been a complete four Gospel codex at some point. If single folia were joined with strips of parchment, that would have been terribly bulky in the binding, wouldn't it? Does any of you know of a codex which may have consisted entirely of single folia? There are also no gathering numbers on the upper or lower corners, in other words very little evidence that this codex ever had gatherings (though it may simply be that none of the first or last sides of a gathering survived among the nine). Or, on the other hand, Hugh suggests that a normally produced codex was at some point torn apart into single leaves to repair another? Does anyone know of another situation like this or have any suggestions as to how this situation may have come about? Glad for shared experience or ideas. Mike Holmes is giving a special lecture on Feb 13th in Princeton on the hundredth anniversary of the birth of Bruce Metzger. More details here. Let us know if there is video Mike. Alas, the event has been postponed due to heavy snow on the East Coast--6"-10" in the offing for Princeton on the 13th. New date TBD. Peter Malik, 'The Earliest Corrections in Codex Sinaiticus: A Test Case from the Gospel of Mark' Bulletin of the American Society of Papyrologists 50(2013), 207-254. 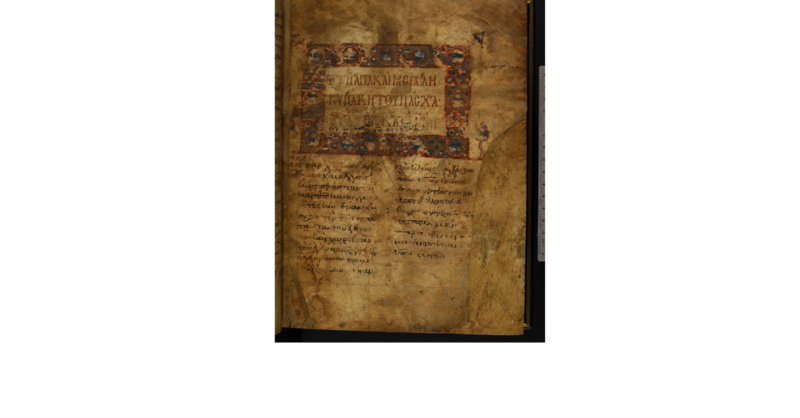 Abstract: One of the most intriguing aspects of the production of Codex Sinaiticus is the corrections made at various stages in the scriptorium. Perhaps surprisingly, no one has yet undertaken to identify these corrections by scribal hands that authored them and by the correction stage at which they were made. Using Mark’s Gospel as a test case, the present study seeks to assign the known scribal hands and the appropriate correction stages to these earliest corrections. After scrutinizing the individual corrections, I shall make some general comments concerning the correcting activity of the scribes in this portion of the manuscript, including a brief discussion of the textual affinities of (some of) the corrections. Congratulations to Peter. This is an interesting study, based on a recent Cambridge MPhil. Among many other things, it has a helpful discussion of the situation at Mark 1.1 (p. 214-219). Incidentally, it also shows the sorts of things that PhD students should be publishing (cf. the discussion here). The Centro di Studi Papirologici of Università del Salento, Lecce, is organizing the Seventh Edition of the Scuola Estiva di Papirologia that will take place from July 14th to July 19th 2014. The School is open to graduates, last-year undergraduates and PHD students in Classical Studies and those people who are concerned with the deepening of the main topics of Papyrology, such as the archaeological search of papyri; the contribution of the papyri to the history of Greek and Latin Literature; the history of Greek and Latin writings; the reconstruction of ways and forms of books’ production and circulation in the ancient Mediterranean area; the study of Pharaonic and Graeco-Roman Egypt; the Herculanean Papyri; Papyri and digital Technology. Moreover, transcription’s exercises of Greek and Latin documentary and literary papyri are expected. The lectures will be given in Italian. Only a limited number of participants will be admitted to the courses. Anyone interested in the School should send the application, a curriculum vitae and a teacher’s reference to the Centro di Studi Papirologici by mail or e-mail. The deadline for the final application will be April 30th 2014. SBL International Meeting, Call for Papers: Hurry Up! This year the SBL International Meeting is held in Vienna, Austria 7-10 July. The Call for Papers has been extended to 12 February, so hurry up and submit a proposal to the Working with Biblical Manuscripts (Textual Criticism) program unit. I have now stepped down from the chair after having served an extended term, and I will instead chair a five-year text critical seminar at the SNTS (with Claire Clivaz and Ulrich Schmid), but my colleague Jan Krans is handling the SBL unit with great competence. Papers concentrating on any aspect of textual criticism are welcome, in particular practical work with manuscripts. Examples of topics include: papyrological insights, scribal habits, preservation techniques, technical developments, computer-assisted tools, the production of critical editions, evaluation of patristic and versional evidence, discussion of particular passages, social historical studies, new projects, systematic-theological problems, teaching text-criticism in an academic setting, etc. So go to the SBL site, log in and submit your proposal! At Hebrews 5.6, in the citation from Ps 109.4(LXX), P46* clearly has the word EPEUX. The corrector has changed this, by marking the word with dots and writing IEREUS interlinearly. The answer is I think not. The crucial addition rule is (as always) Hort's dictum: "Knowledge of documents should precede final judgment upon Readings." First, this is the only place in Hebrews in P46 where we have EPEUX for IEREUS. 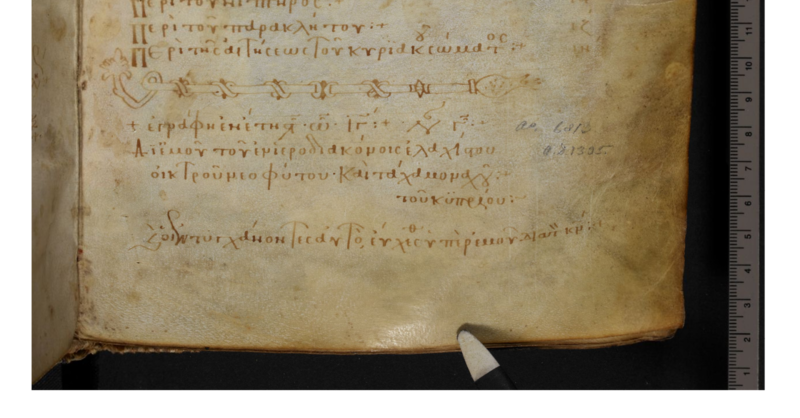 Every other citation or allusion to Ps 109.4(LXX) has IEREUS (e.g. 7.1, 17, 21). Secondly, this reading is not supported by any other known witness. It is a singular reading to P46* and is corrected in the manuscript. Thirdly, P46* has some form. Royse counts 16 singular readings in P46 which result in 'words unknown to grammar or lexicon' (Scribal Habits, 254). Fourthly, this corrector, with the black ink and thick strokes is most probably the scriptorium corrector (the second corrector, after the scribe himself, so Zuntz, Text, 253, supported by Royse, Scribal Habits, 235) - his task is not comparing the scribe's production with an alternative exemplar, but to correct the worst errors of the scribe's production. Fifthly, there is a visual similarity between EPEUX and IEREUS - many errors begin as simple mistakes of words that look somewhat similar (Zuntz suggested that there may have been Latin influence prompting the P - R confusion, although Royse finds no other examples, see pp. 260-262).